Back in October, Tech.co.uk brought you news of the mighty Leema Acoustics Stream CD player - an innovative multi-DAC machine set to take the audiophile world by storm. Now, just as Christmas is approaching, the Welshpool-based team of ex-BBC engineers has announced full details of a matching amplifier, the Pulse. 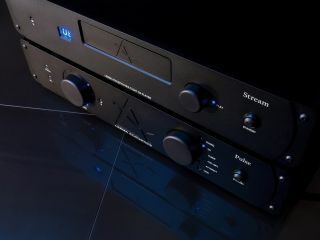 Also priced at £1,000, the amp has been designed to compliment the Stream CD and is said to be largely based on the company's £2,000 Tucana integrated amplifier. A spokesman for Leema Acoustics said, "By carefully slimming and honing the Tucana design, and by adding exciting new features, Leema have produced a new reference amplifier in its price band, less than half that of the Tucana." The exciting new features include a front-panel-mounted MP3 player input, a record output, full remote control with sophisticated volume display, and a headphone output. There's also full short circuit protection for total peace of mind. The Pulse's input selection includes a LIPS-configurable AV input (which enables the Pulse to automatically configure other devices into a multi-unit home entertainment system), and for vinyl lovers, separate moving magnet and moving coil phono inputs.